This is your most basic soap making technique. Perfect for toddlers. Just Melt and Pour! 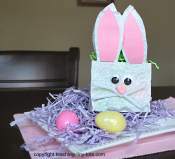 Fill a soap dish or wrap in a clear cellophane bag with Easter grass and give as a cute gift or use as decorative soaps. Remove soap from container. Cut only cubes needed. Place in Pyrex measuring cup or microwaveable container and microwave as directed. Add color or fragrance if desired. Pour into mold. 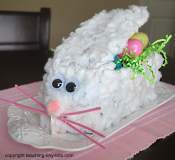 We used the top half of a bunny container. Let dry for 40 min to an hour and pop out of mold by gently pressing back. You will see it separate from the mold. Explain the activity to your child. With proper precautions and heating as directed, your child can assist in pouring into the molds. A small glass Pyrex measuring cup worked best for us since the handle stays cool. For extra safety wrap a thin silicone hot pad around cup part while you help your child pour into the mold. Again you know your child best and can determine what is safe for him or her. Melt just until cube is dissolved. Soap will be warm but fluid and your child can help pour into mold with your guidance. If it gets too thick, just microwave again for 5-10 secondss depending on your microwave. Watch so you don't overheat. When using hard plastic molds like we did, you have to put gentle pressure in various areas to loosen. You can see the soap lifting off the plastic as it becomes more opaque. If it doesn't slide out after pressing all around, an adult can carefully use a paring knife and slip the tip under the rim to gently "pry" out. Make sure children aren't watching you do this as a precaution. Pour clear soap into mold. Put one drop of color. Mix with a coffee stir. 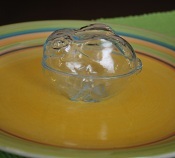 Let set while you add a drop of a second color directly into your melting container. 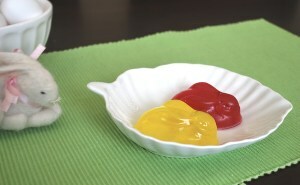 Mix and pour into same mold after 5-10 minutes. See photo above. The second heart is made from two colors. Using an white opaque soap will show results much clearer. 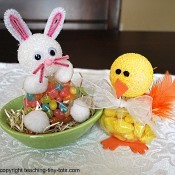 Fill mold with clear or opaque soap. Place one drop of color into the mold and stir with a skewer or coffee stir to create a tie die effect. 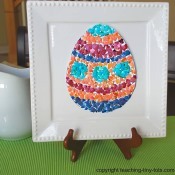 Great toddler activity to develop sequencing skills. Write out the directions in a simple sentence and read each step as you do it. Perfect opportunity to talk about colors.